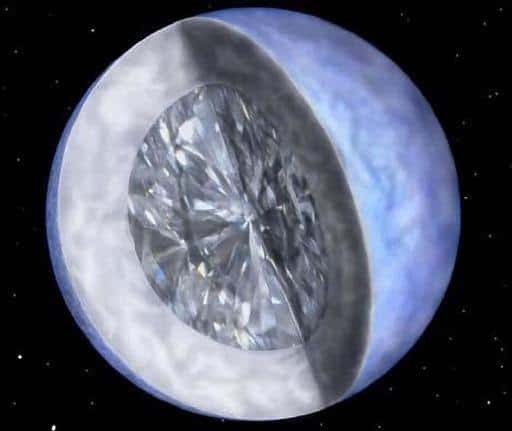 The Diamond Star was discovered by astronomers at the Harvard-Smithsonian Center for Astrophysics. It is about 50 light years away from the earth and is located in the constellation Centaurus. Scientists estimate that it measures approximately 4000 kilometers in diameter. The gem is located in the heart of a dead, crystallized white dwarf star. Scientists have been able to study the center of the star by measuring pulsations. Diamond specialists have estimated that the gem is about 10 billion trillion trillion carats. Of course it's impossible to grade the diamond in the usual way. According to one of the astronomers from the Harvard-Smithsonian Center for Astrophysics a jewelers loupe the size of the sun would be needed in order to do so. The one thing that jewelers are certain of however is that this diamond is much too big to wear!